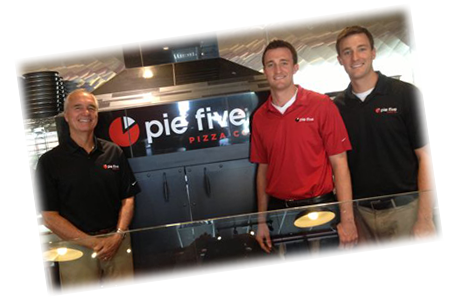 We sat down with a few of our franchisees to talk to them about being part of the Pie Five Pizza family. Here’s what they had to say. Want to learn even more about our franchisees? Just click on their name to access their bio to learn how they got started in the business and the path that brought them to Pie Five. Rich Davis is president and CEO of RAD Consulting/Development. 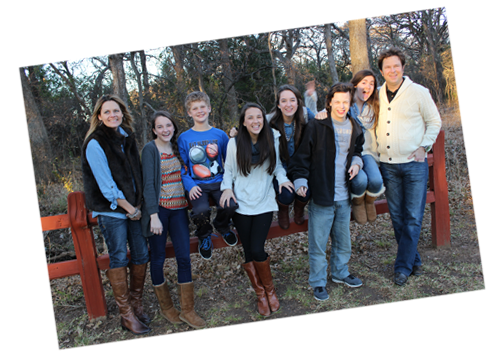 Davis earned a degree in accounting from Baylor University and began his career at Ernst & Young. In 1996, Rich began franchising Schlotzky’s Restaurants, developing the chain’s first restaurants in Tennessee. Why did you decide to join the Pie Five Pizza brand? From the first moment I walked into the Pie Five in Frisco, TX, in August of 2013, I was immediately intrigued by the functionality of the layout, simplicity of the concept, and quality of the product that I experienced that day. I actually visited the store just to have a lunch and left about an hour later with a vision of brining the Pie Five concept to Nashville, TN. I had owned and operated several delis before, but had never really come across a concept that was compelling enough to really consider buying an entire market territory. But, the more I looked into the idea, the more I believed Pie Five Pizza is right in the sweet spot of what the market is looking for. What type of ongoing support do you get from corporate? The support from day one has been great. I have never once been unable to get a question answered or some feedback on anything I need. The people who run the organization have been extremely professional and responsive from top to bottom. From site selection, construction, training, and marketing, it has all been pretty seamless with great communication. 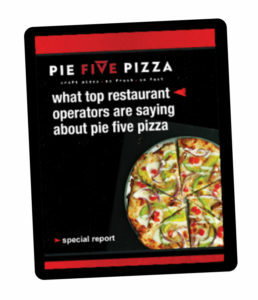 What do you think sets Pie Five Pizza apart from the competition? Obviously, there are others looking to break through in the fast-casual pizza sector, but I think Pie Five has the right formula. The process is simple and repeatable in terms of preparation and cooking methodology, the product is varied enough but focused at the same time, and the culture and image that Pie Five has crafted is at a very high level. Additionally, the one price for all pizzas is proving to be a great offer that everyone likes. What do you enjoy most about owning a Pie Five Pizza franchise? Well, we actually open our first store in Nashville in early July so that is hard to say right now, but so far it has been an enjoyable and smooth experience to date. Ask me this in six months. Where do you see the Pie Five Pizza brand going in the future, and how do you think this will benefit you? From what I am seeing, there is nowhere to go but straight up. It seems like every month there is a new entrepreneurial group taking on a market for expansion. I think the national momentum and exposure the brand is experiencing will help all of the franchisees as we grow our business. The fact that Corporate is also expanding into their own markets and have “skin in the game” is a big statement to me as well. I think the future looks bright, and I am excited to watch it unfold. What advice would you give someone thinking about investing in Pie Five Pizza? Come experience the product, hang out in a store and watch the flow, the customers, the process, and I think you have to be impressed with the concept and that the public loves what Pie Five is delivering – great custom pizzas in five minutes at one fixed price. Developing, opening, and operating a food service business takes a lot of work and execution as well as risk of capital, but I believe Pie Five has all the signs of a winner from the financial percentages and cost as well as the image and product. There are many investment opportunities in the food sector, but Pie Five has to be on anyone’s short list. Jeff Percey graduated from James Madison University with a Bachelor of Business Administration in Marketing. He began his career in sales and was promptly named “Rookie of the Year” and two-time 100% club member. In 2003 he and his wife Deborah became one of the first Franchisees of Five Guys Burgers and Fries. He is recognized by Five Guys as a critical player in the growth and success of what is America’s fastest growing restaurant chain, according to Forbes in 2012. I felt that there was a huge hole in the fast-casual segment, and Pie Five perfectly fills the pizza void. Everyone loves pizza…I researched fast-casual pizza for many months and determined that Pie Five was the best option for the future. My wife and I felt very strongly about the leadership team and the direction they were planning on taking the brand. Most of the operational intricacies had already been worked through and the brand was ready to take the next step to grow via franchising. I also agree with the franchise development strategy of having franchisees own and develop entire markets. All levels of support are given, including marketing, operations, store opening, and training. I have been very pleased. Consistency. I believe the systems are in place to ensure the quality of the product and proper execution of the operation. The hiring philosophy and level of hospitality provided by the team are huge differentiators as well. I am very proud of the entire experience that we provide our customers. The product, the look of the store, and the philosophy of hiring personalities that engage guests all lead to tremendously positive dining experiences and great feedback from customers! I believe Pie Five will do what Chipotle has done for burritos and what Five Guys has done for burgers. So long as the system is held to first-class consistency standards, we will benefit on several fronts. We will have brand recognition and incredibly profitable restaurants. As a stockholder, I will also benefit from the climbing share price of PZZI. If they are looking for the next big thing in fast casual, Pie Five is it. I would stress to them that they be patient with real estate and be smart with site selection. I would encourage them to be heavily involved operationally and support their community. However, if they are NOT truly operationally savvy, I would discourage them from their pursuit of becoming a franchisee, as they would only be a detriment to the brand. Dave Goebel has 35 years of experience in the retail, food service, and hospitality industries. He served as Chief Executive Officer of Applebee’s International Inc. from September 5, 2006 to November 2007 and was President from January 1, 2005 to May 2008. Prior to joining Applebee’s, Dave headed a management company that provided consulting and strategic planning services to various businesses. Prior to 1998, he was a franchise Principal with an early developer group of the Boston Market concept. Mr. Goebel’s business experience also includes positions as Vice President of Business Development for Rent-A-Center, a subsidiary of Thorn, EMI and Vice President of Operations for Ground Round restaurants. We decided to join the Pie Five brand because following our due diligence in the fast-casual pizza space, we loved the simplicity and relevance of the concept, the quality of the franchisor management team and their commitment to both franchise and company growth, and the guest response to this very consistent, high quality, high value customer proposition. Our ongoing support from corporate is first class. It begins with the operating, training, and marketing support but extends to the accessibility and availability of the entire management team when we have a question, need support, or just a partner’s ear. It is the strength of the concept, the strength of the franchisor management team, and the impressive group of franchisees being added to the system that set Pie Five apart from the competition…along with a consistently great product and product innovation. We most enjoy the growth potential, the strength of the financials, and hearing our guests’ everyday compliment our restaurants. I see rapid but controlled expansion of Pie Five in the US. It’s as if the word is out about this great concept and there is no stopping it now. As we continue to gain greater brand recognition and “buzz” throughout the states, we all win! For someone thinking of investing in Pie Five Pizza, I would say this is the premier concept in the fast casual pizza space. I would encourage them to be maniacally focused on hiring and training great team members and committing to only A/A+ real estate sites and to become good partners with their franchisor team. Jeff Mengel graduated from James Madison University with a degree in Political Science in 1996. He served various positions with American Pool Management, a subdivision of American Pool Enterprises, before entering the restaurant industry. In 2003 Jeff and his partners successfully franchised Five Guys Burgers and Fries in the Baltimore and Richmond markets. In August of 2013, Jeff signed a development agreement with Pie Five Pizza Company to develop 12 locations in the Baltimore market. A couple of years ago, after riding the better burger explosion, my business partner and I began discussing what would be the next big thing in the fast casual arena. Pizza trends were beginning to be discussed prominently. After researching several of the brands at that time, Pie Five really stood out to me because of the warm, inviting décor inside the restaurants, the fun and edgy approach with lingo and marketing to customers, as well as the established systems/procedures already in place at Pie Five. We knew all of these things would allow the brand to be successful at franchising. While fast casual pizza may be in its infancy in development, Pie Five Corporate has the backbone to get it right from the start while other brands may be trying to “figure it out.” From Randy & Chris, all the way through the Construction, Marketing, Training, and Operations teams, there are seasoned veterans who have a long history and track record both in pizza and in other fast growing concepts. The knowledge and guidance is fantastic regardless of what prior experience you are bringing to the table as a franchisee. While imitation may be the finest form of flattery and many others are trying to capitalize on the fast casual pizza trends, Pie Five has really gotten the recipe right in a lot of ways. Four different crusts are unique – others cannot boast the same. Three different fantastic desserts are also unique with other brands often offering just one option or no option at all. If you then throw in the occasional dessert or pizza Limited Time offering, you keep the customer engaged with fresh concepts and great food choices. Pizza is fun. Everyone loves pizza, and at Pie Five the ability to guide the customer through the kitchen process and create a fun experience for the guest is fantastic. Any restaurant owner has to love people as much as they love the food! Where do you see the Pie Five Pizza brand going in the future and how do you think this will benefit you? Pie Five is exploding, and it is going to be a fun ride. With great franchise and corporate operators that can execute the procedures/policies on a daily basis and deliver quality food and great guest experiences, the brand is poised well for tremendous success. It benefits us in our market when everyone succeeds. That is part of joining a franchise – you need to take care of your own backyard, but you want everyone else to succeed on a national level. 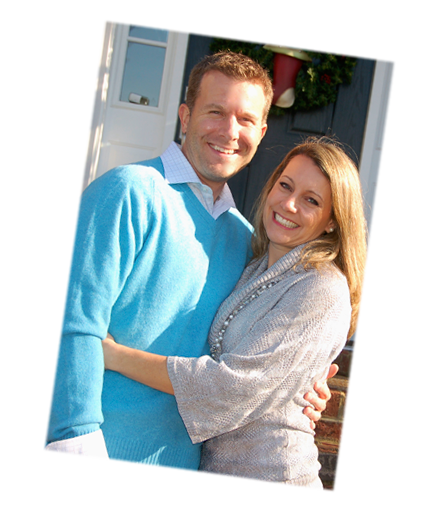 Nathan Cage has more than 12 years of experience as a franchisee. He opened his first Wingstop in 2002 in Lubbock, TX and has been named Local Store Marketer twice since 2009. Prior to entering the restaurant industry, Cage worked for 23 years in the aviation industry. He currently serves as a director on various boards, including Big Brothers and Big Sisters and the Alliance Corporate Challenge. I choose the Pie Five concept based on one thought: I love the product as a food choice. The Pie Five support team is organized and provides clear directions that are easy to follow from a perspective of developing the brand. It is nice to have a company that can (for example) support you with site selection and also travel to view locations. It’s a complete business model that provides the franchisee an assurance of knowing that there is truly a combined team effort. Business expectation sets it apart from all others. I was able to look at a number of different concepts prior to selecting Pie Five. The one element that sold the concept for me was the first-class approach to doing business with a winning formula. I have an ability to operate and build a team for success and also provide others an excellent opportunity to generate their own wealth and freedom. Pie Five is on pace to become one of the best franchise concepts in the realm of pizza. That combined with the business model means success for me as well. Get in while the concept is still available to franchise.